Many churches say they want to grow and be a better witness for Christ in their mission fields. But they fail to implement and use an intentional discipleship system that would transform that dream into a reality. That was one major point shared by the Rev. Dr. Phil Maynard, a well-known United Methodist author and discipleship coach, during a two-day workshop Nov. 3-4 in Lincoln. The information was shared as part of a New Church Development gathering at Christ United Methodist Church, but the presentation was made available to all clergy and laity in the conference and beyond via a livestream broadcast. 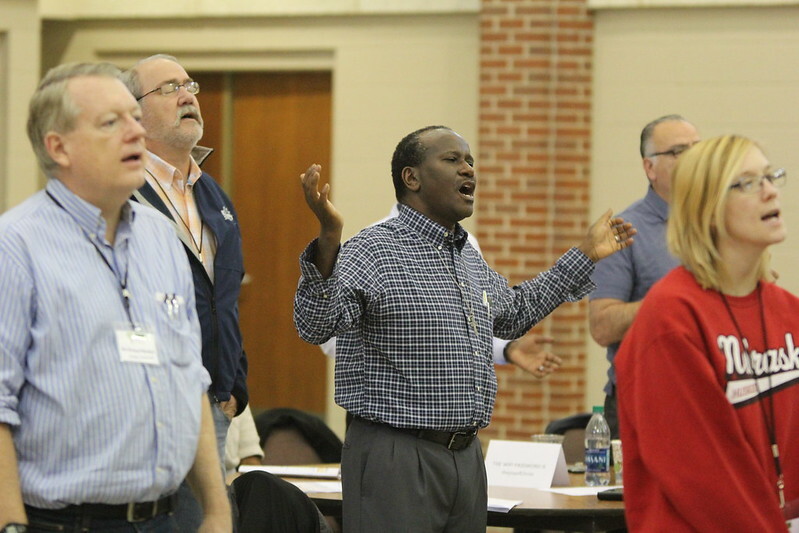 Over the two days, Maynard walked participants through his discipleship system. He stressed that his system worked well for him and churches he served over the years, featuring such components as required classes prior to membership and agreement to live into a covenant related to spiritual disciplines. But he urged participants either to craft his model to their particular circumstances or to design something uniquely their own. The Rev. Nathan Stanton, director of congregational excellence, said Maynard’s presentation fits well with the Great Plains Conference’s emphasis on serving each church’s mission field. “That mission field is right outside the front door,” Stanton said. “It is no longer only in a place far beyond the bounds of the United States. The mission field is the community each church currently serves. Dr. Phil Maynard approaches the mission of the church, to make disciples of Jesus Christ for the transformation of the world with three key words. Discipleship is done: intentionally, relationally and with accountability. Maynard stressed the importance for churches to become intentional in their discipleship – from providing clear expectations of followers, both people new to Christ and people more mature in their faith, to providing classes, small groups and further guidance for people further along the faith journey. Regardless of how individuals are moving on their discipleship paths, congregations must move together beyond the walls of the church building, Maynard said. That movement can start with prayer, he said, by ensuring prayer time focuses on more than the desires of people in the pew, citing such self-centered petitions as those on behalf of “Aunt Sally’s ingrown toenail.” The effort then moves on to service and interaction with people in the community. Shifting to how churches can support people as they mature in their faith, Maynard said how people move along their discipleship pathway will vary widely. Using a video spotlighting a group of people climbing a rock wall, Maynard explained how all climbers shared the same goal of climbing to the top, and everyone cheered on fellow climbers, but each person took very different paths to the top. The same goes for discipleship in the local church. Maynard introduced a chart that showed stages of how people mature in their faith just as they do developmentally. Searching – People seek meaning for their lives. Exploring – They attend church but have not yet committed to following Christ. Beginning – The largest and most-active segment, people in this group are growing as they attempt to understand their newfound faith. Growing – They seek to integrate their faith into their lives in a holistic way, and they look to Jesus to help them live their lives. Maturing – They are Christ-centered, and instead of expecting Jesus to help them live their lives, they lay down their lives to serve Christ. Maynard said churches appear to be largely focused on people in the earlier stages of faith development, which is important. But that means people who are further along in maturity often are less satisfied with their churches because they no longer feel challenged and, therefore, are no longer growing in their faith. And while one-on-one interaction is a key element in some parts of a discipleship system, Maynard emphasized that such an undertaking is something the pastor cannot do alone. “Go back and find yourselves a team who will work with you, who will study this stuff, who will work with you over the next year or two,” Maynard said. Stanton echoed that advice to create a team. The approach of developing an intentional discipleship system can have impacts beyond a single congregation, Stanton said. He said districts could utilize resources already present in their areas where churches are successfully living out the purpose to make disciples through intentional systems. “Those churches living out their discipleship system can share, teach or lead other congregations in their networks or outside those networks to create their own pathway of making disciples,” he said. One way individuals can grow in their discipleship, Maynard said, was for them to tell their stories. Sharing their stories of how they came to know Jesus and how Christ has changed their lives can serve as a powerful witness to people with whom they have relationships. Unfortunately, Maynard said, people often shy away from telling their stories because they fear that they don’t know enough to confidently serve as a witness for Christ. Stories that build on relationships provide a framework from which to begin leading someone new to Christ down the pathway to discipleship. Maynard said such interactions and the intentional environment that follows – from Sunday school classes to small groups to spiritual coaches – helps the person being discipled mature and, eventually, lead others to Christ. Maynard said the progression shows faith cannot be practiced in private. “Discipleship is a contact sport,” he said.